We went to an art show in East Nashville Friday night. Saw wild, crazy, amazing, beautiful art. Colors bursting, thought provoking. Photographs, music, paint splashed, beautiful lines. A gal walking around with a glitter splashed chest and little else. 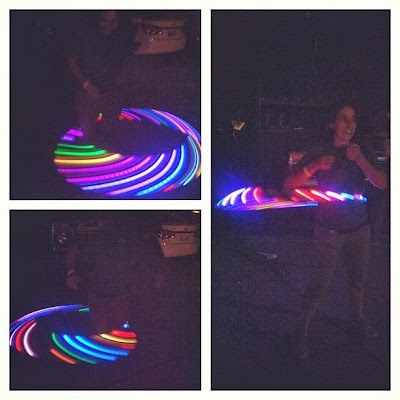 Glowing hula hoops and a guy painting the universe for anyone so inclined. I learned that this lady is a hula princess. Blue ribbon winning, in fact. She's always surprising me. We're going to have a hula hoop contest soon. I'll let you know the winner.